how can data help improve your business? As a business owner, you know that effectively utilizing data is vital in making smart, long-term decisions. But how do you know you have all of the data to make those decisions? Are you stressed or anxious about your data integrity? Are you taking advantage of all your data has to offer? Finding and compiling the numbers you need, creating reports from them, and making decisions from metrics can be overwhelming. You can't do the entire thing yourself with everything on your plate, and hiring someone to do it for you internally is a very costly pain. Is there a way to see the relevant data you need in a high-level report to make the best decisions for your business? There is! We can solve ongoing issues for you; finding where you lack data information, integrity, governance, processes, and organization. Vizion Solutions has over 15 years of experience empowering Business Owners, Presidents, and CEO's to make more informed decisions, faster. Read on to see how our solutions will help better your business. Have you ever come across a service or product you identified as an opportunity that could improve your company and bought into it instantly? Capitalizing on growth opportunities can change the course of your company's success and nothing is more disappointing than losing out on promised or expected value. Sometimes the best opportunities are found within internal operations and strategy. 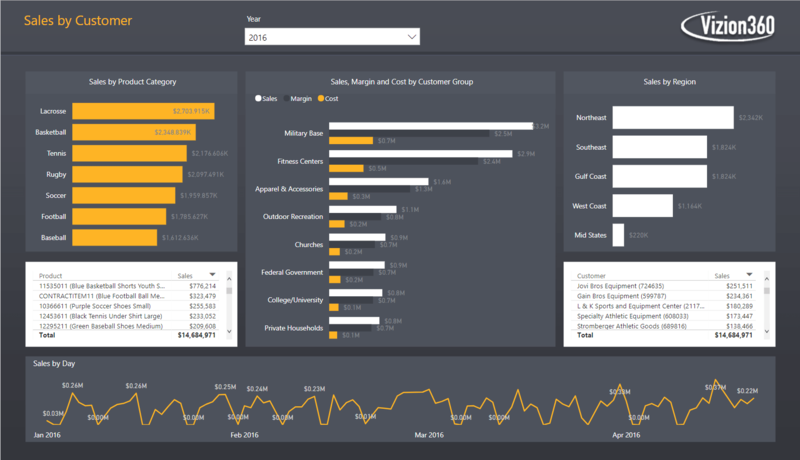 Our reports allow you to drill down by customer, product category, buyer group, region, revenue, sales margin and cost. Giving you the flexibility within your numbers that lead to more informed decisions. Our solutions will help you see the opportunities with the best ROI that get lost within mounds of data. We reduce the risk and cost of data in addition to bringing it to life. Vizion's data and business intelligence solutions will help grow your top line, improve your profitability, increase productivity and manage risk. Trust us, as data experts, you'll be able to see measurable improvements when you harness the power of your data. You know you need to harness the power of your company data, but with multiple departments, different areas of information, and inconsistent collection where do you even begin!? Getting started on your data is the hardest part. Vizion sets you up for success and has consulting expertise so you get the best results you can see up front and fast. This case study highlights our client's success with our Profitability App. It is a favorite among CEOs as it brings customer/product insight. See the proof for yourself.